Chain? : Not to my knowledge. Reservations: Maybe with your tummy so it knows to be empty! I love a good buffet (emphasis on GOOD). Which, in my humble opinion, is not always easy to find. So I must say over the years I have become a tad jaded - having developed the attitude that I will always leave a buffet at most 75% satisfied. Why go you ask? Well, I live in the average home with multiple opinions/cravings and a buffet typically leads to satisfying most of them! 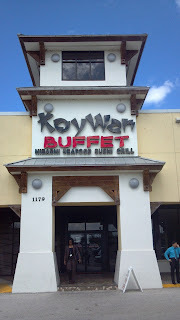 I was told about KoyWan by my Sister-In-Law who said it was great. She is a huge sushi lover and when she informed my Hubby that it was all you can eat for under $8..let's just say that sealed the deal. We walked into KoyWan and I was quite pleased with the atmosphere. Clean, organized and just the right amount of stereotypical décor. From the entrance you can see the sushi bar looking fresh with a wide assortment, and being restocked frequently by the sushi chefs behind the bar. I am not a sushi person - I can't get passed the seaweed. I am a texture person and although I have tried repeatedly, I admit defeat and recognize my short comings. Yet, as I scanned the bar it made me want to be a sushi person because it looked delicious. It also left me a tad worried - was the rest of the place going to be mediocre because they put so much into the sushi bar? 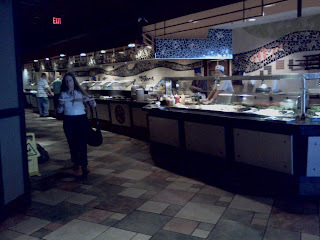 Right after the sushi bar was the Hibachi center. Basically a long row of meats, seafood, rice or pasta, and tons of fresh veggies for you to pick from then they cook it up for you (think stir fry with flare!). Heaven! I love me some fresh veggies! I didn't get any further at the moment. I grabbed a plate and loaded it up - fresh beef, rice, bamboo shoots, broccoli, carrots, Napa cabbage, bean sprouts, zucchini and pineapple. I handed it off and went to check out the rest of the place at it was cooking (took about 5 minutes to cook). Next in line was salad row. It was pretty classic - green salad, fruit salad, seafood salad and so on. The next couple rows were your typical Chinese food buffet, including the soup station. I am a sucker for a good wonton soup so I grab a bowl and keep on going. The last row before the dessert station was the row of "everyday foods" which I am assuming is geared towards children. Pizza, French Fries, Chicken Wings and Nuggets - and then at the end - another surprise - there is this baked fish/chicken/roasted meat mini station. On making a mental not to grab some of the chicken, I head back to get my hibachi plate. As I approach the Hibachi the chef places my plate on the bar and with a thank you, quick smile and collection of some ponzu sauce I was off to my seat to dig in. It was DELICIOUS! Even before the sauce it was perfectly seasoned and perfectly cooked. I cleaned my plate in no time (almost forgetting to take a picture!) and seriously debated getting another - but then I remembered that chicken. I collected myself, as the super sweet server can promptly to collect my plate, and headed back to the buffet. My first stop - the chicken - then I grabbed a random assortment of other dishes. My choices - chicken with broccoli, garlic sautéed green beans, peanut chicken, Veggie Mei Fun, Pan-fried Gyoza and a spring roll. This next plate was 50/50 and here is what really surprised me - it was the fried food that was not the greatest. Everything that was fresh ingredients (the chick with broc, green beans, Mei Fun and Gyoza) was delicious, well seasoned and fresh. The peanut chicken - not a fan, and the spring roll wasn't worth the calories. The baked chicken I had grabbed first was heavenly. It was cooked (perfectly by the way) in a lemony, herby delicious sauce and just hit all the right notes with my taste buds! It appeared to be a crowd favorite because as I headed to the dessert bar I noticed its platter had been picked clean. Even my Sister-In-Law knew the chicken I was talking about when I mentioned it. I took a second scan through the buffet rows and came across the steamed dumpling station - a selection of different steamed rice dumplings with different fillings. I grabbed one to try, there was no label to tell me what was in it and carried on. 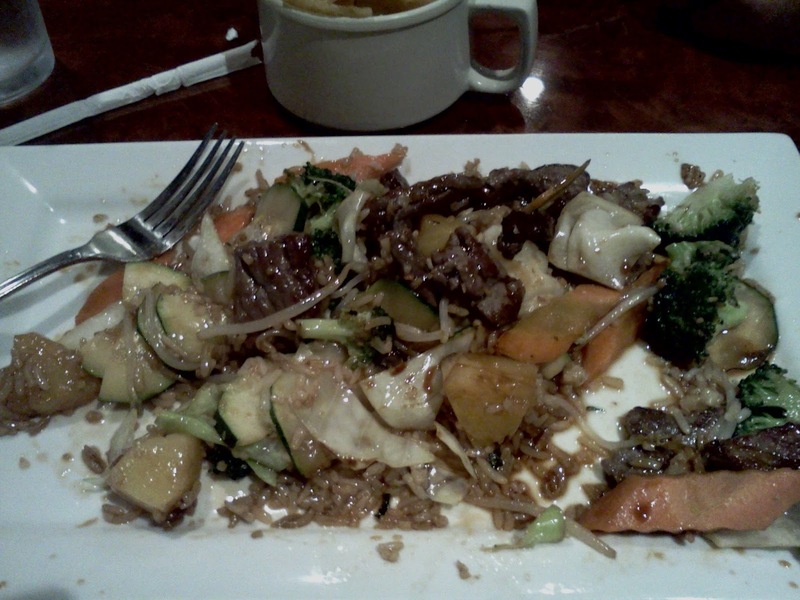 I also grabbed the pepper steak and mixed Chinese veggies. The steak and veg - yum. The steamed rice dumpling - strange...very very strange. It turned out to be prune filling and it wasn't bad...it was just strange. The texture was weird and ya -strange. I gave up trying any of the others. Now at last, the Dessert bar. One word - MEH! As I find with pretty much all Buffet dessert bar, it sucked. Your common place Jell-O, puddings and fruit - along with bland flavorless cakes and cream puffs that were more puff than cream. They also have ice cream with a small topping bar. I thought the one saving grace would be the frozen yogurt station - but as I approached I was told it was broken and usually is - poop. You are better off skipping dessert all together...or hitting up Wendy's for a 99¢ frosty. All and all my meal was good. I loved that the fresh prepared and veggies outshined the fried foods. 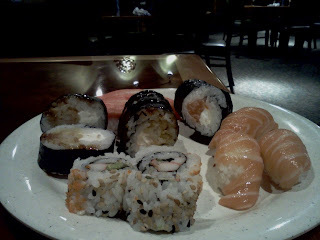 My Hubby was overjoyed with the Sushi and he also enjoyed the Hibachi. Our waitress was pleasant and prompt - our glasses were never empty and our plates were never left on the table for too long. The manager even popped by to see how we were doing. When the bill came - for both of us including one soda (I had water) and tax was just under $19. Granted this was a weekday lunch (which is $7.95). After 4:00pm the price does go up to 10.95. And weekend lunch is a dollar more than weekday. Kids under 3 do eat free and all other ages have reduced pricing (which is available on their website). 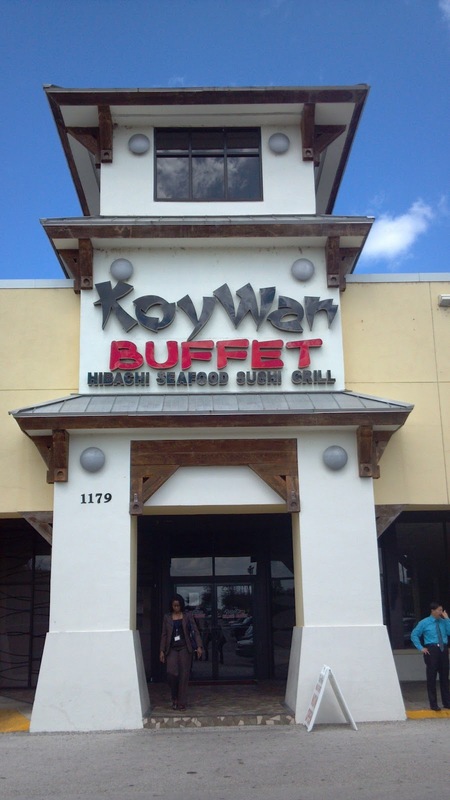 Over all, I will go back to KoyWan (I probably have already) but instead of dessert I think I will just have an extra gyoza or two! Happy Eating, and let the Chopsticks be your guide!